This past week, the EatingOxford.com page (@eatingoxford) on Twitter reached 3,000 followers! 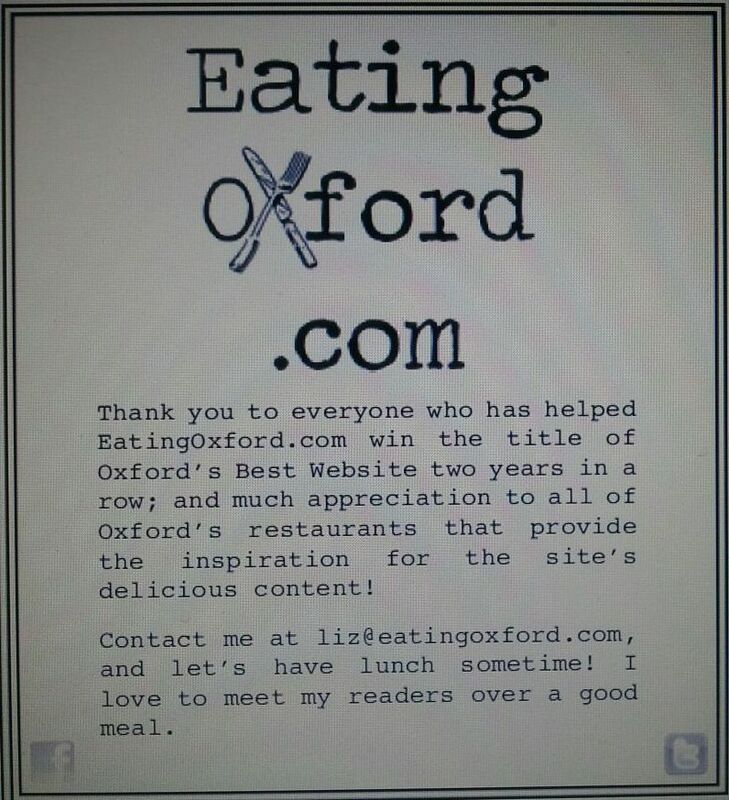 Thank you to all of you who have been such big supporters and followers of the EatingOxford.com site and blog since it’s start at the end of 2009. Stay tuned for much more to come! 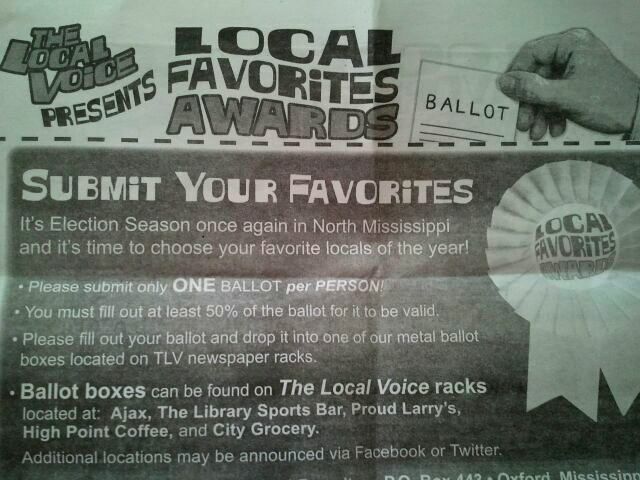 The Local Voice announced the winners of its Local Favorites Awards today! Your votes decided the winners. Pick up the current issue of The Local Voice to read about all of the winners. It’s time once again for the annual Local Favorites Awards in The Local Voice, and as EatingOxford.com celebrates its 3-year anniversary, I’d like to take a moment out of regular blogging activities to ask for your vote again this year. There is a category for Best Website and Best Twitter Feed this time around and I would so appreciate votes for each if you feel so inclined. At least 50% of your ballot must be filled out to count, so don’t forget to vote for all of your favorite restaurants, shops and bands around Oxford as well! The voting ballot can be found in the current edition of The Local Voice and all votes must be turned in by November 19, 2012. I just finished having a video produced to help promote EatingOxford.com and, of course, I wanted to share it with all of you first! Click here or on the photo above to launch the video and let me know your thoughts. Want to find out how to have a similar video made for your own business? Ask me how at liz@eatingoxford.com! Thanks to all of you who voted for EatingOxford.com in the recent Oxford Eagle Best of Oxford poll. For the second year in a row, EatingOxford.com won as the Best Oxford-Themed Website! See the full Best of Oxford winner list here. If you caught my ad in the issue (shown above), I meant what I said. I’d love to meet some of you over lunch sometime! Contact me at liz@eatingoxford.com if you’d like to chat about food at a favorite Oxford eatery. The numbers are in and the money has been counted. Thank you to everyone for coming out to the EatingOxford.com anniversary Food Frenzy on Thursday night! Because of all your support, EatingOxford.com is able to donate $1,000 to The Pantry! See the official press release below; I’m sharing it with you first. Photos from the event, taken by Tracy Morin, can be seen here. 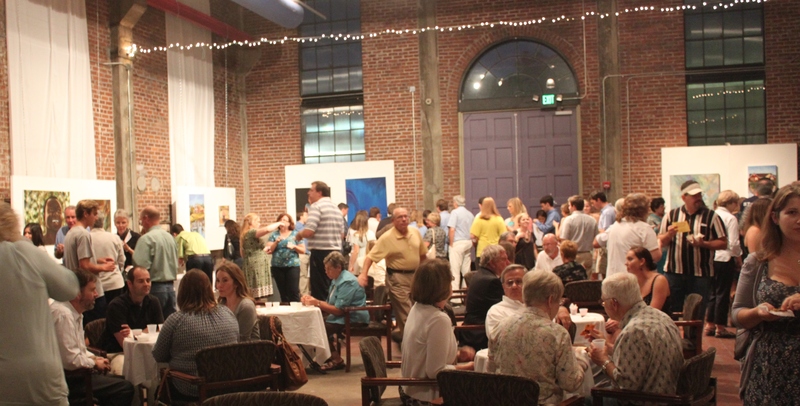 (Oxford, MS, October 1, 2011) The EatingOxford.com Two-Year Anniversary Food Frenzy, held Thursday, September 29, at The Powerhouse in Oxford, Mississippi, was an overwhelming success, with more than 125 attendees and nearly two dozen local restaurants participating. Special thanks go to Wayne Andrews, executive director of the Yoknapatawpha Arts Council and all of the staff at The Powerhouse; Lee Craven, executive chef/food specialist in the Department of Nutrition and Hospitality Management at the University of Mississippi along with his hospitality students; all of the restaurants that donated food, which included 6 ‘ N Tubbs, Ferdinand’s, Honey Bee Bakery, Lusa Pastry Café, Main Squeeze, Mink’s On the Park, Olivia’s Food Emporium, Panini, Petra Mediterranean Cuisine, Proud Larry’s, Rice & Spice, Tacky Shack, Taylor Grocery, Tribecca Allie Café and Turkuaz Café; all those who donated items to the raffle, including Tribecca Allie Café, Panini, Proud Larry’s, Old Venice, Mink’s On the Park, Ravine, My Michelle’s, Firehouse Subs, Kabuki, Colonel’s Quarters, Mary Margaret Andrews, Troy Gilbert, Rocky Mountain Chocolate Factory and Snackbar/Old Thyme Farms. EatingOxford.com provides locals and out-of-town visitors with a comprehensive listing of the restaurants and menus in and around Oxford, along with a regularly updated blog that keeps site visitors in tune with what’s going on around town. To date, more than 200,000 visitors have come to read nearly 400 posts on the EatingOxford.com blog (http://blog.eatingoxford.com), helping to move it up the ranks to No.1 blog in Mississippi on Urbanspoon.com and win it Best Website in Oxford. The website and blog combined garner more than 50,000 web visits per month. For more information about EatingOxford.com, as well as site sponsorship opportunities, contact Barrett at foodie@eatingoxford.com or 662-380-6316. It’s finally here! The EatingOxford.com Two-Year Anniversary event is happening this Thursday, September 29, from 7:00 p.m. to 9:00 p.m. at The Powerhouse. 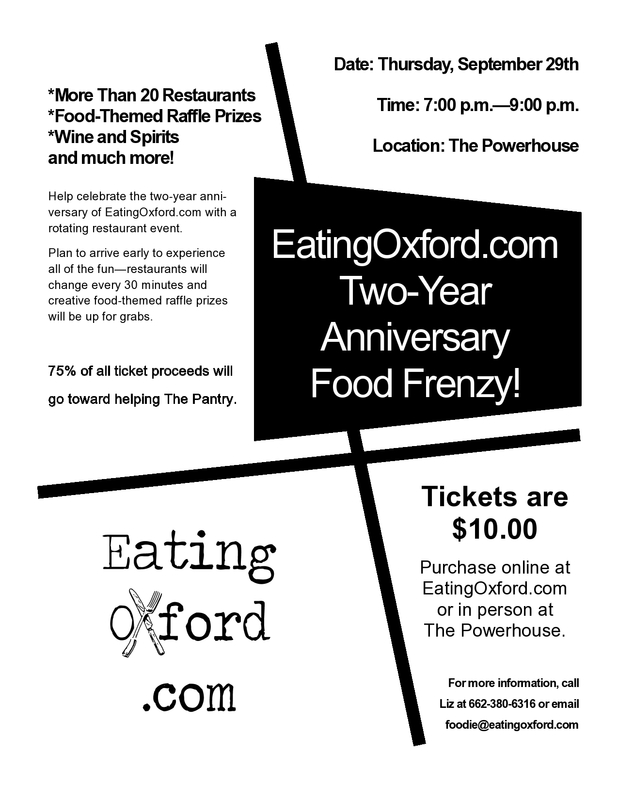 Many of you have already secured your tickets online at www.EatingOxford.com or at The Powerhouse. You can also purchase them at the door on the night of the event for only $10.00! Don’t forget that 75% of your admission price will be donated to The Pantry. An on-site food-themed raffle will occur every 30 minutes, so bring a few extra dollars to win some fabulous prizes such as gift certificates for Ravine, Tacky Shack, My Michelle’s Tribecca Allie Cafe, Firehouse Subs, Kabuki, Old Venice and Colonel’s Quarters at Castle Hill; gift packages from Rocky Mountain Chocolate Factory and Old Thyme Farms; and a variety of unique cookbooks! Looking forward to Eating Oxford with everyone on Thursday!